The gilets jaunes’ protests started on Saturday, 17th of November 2018. France has a long history of citizens taking to the streets to force the hands of the government over the past 50 years. 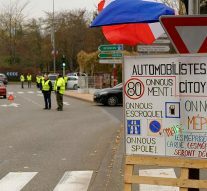 The “yellow vests” blocked roads and caused traffic chaos. The demonstration arose from anger over rising fuel prices and taxes. These protests have been occurring over economic issues in France and will spread all over Europe. This article aims at presenting the press clipping from the protests. Taxes on both petrol and diesel have been increasing at the same time and a further tax increase is planned in 2019. Those increases made the diesel as expensive as petrol and this triggered the protests. The web portal TheConversation reported that for the first time in his presidency, Emmanuel Macron looks worried, and well he might. Since January 2018, his popularity has withered, falling by half to 25%, while surveys suggest around 70% of the population now supports the protest movement which has adopted “Macron, resign!” as one of its slogans. Public support has steadily risen over November and in one survey a staggering 42% of respondents said they planned to actually join the movement. Rising fuel prices ignited it. From October 2017 to October 2018, the pump price of petrol in France rose by 15% and diesel by 23%. Although two thirds of the increase in pump prices can be attributed to rising international oil prices, the remaining third is down to Macron government ratcheting up the green taxes on fossil fuels introduced by his predecessor. These taxes are the key policy instrument intended to ensure France meets its climate change targets. They are designed to send a “price signal” to consumers that they should reduce fuel consumption, buy more fuel-efficient cars and change to alternative modes of transport. On another hand, the Spectator pointed out the conspiracies over the protests themselves. They announced that Marine Le Pen spent last Saturday commenting on the scenes from the Champs-Elysées as the latest Gilets Jaunes demonstration turned violent. She also had the opportunity to respond to Christophe Castaner, the Interior Minister who, as cobbles rained down on the heads of the police, accused Le Pen of inciting the far-right to go on the rampage. Le Pen rejected the allegations, saying she had done no such thing; and anyway, as far as the National Rally leader was concerned, the people running amok in the capital weren’t from the far-right. Le Pen’s view was endorsed by Marion Maréchal, who, unlike her aunt, chose to witness the latest manifestation of working-class discontent not from the warmth of a television studio but from within its ranks on the Champs-Elysées. Analysis of the Economist concerning these protests goes into the public visibility and popularity of the French president Mr. Macron. In their newest text, they consider that the protests «hurt the French President». The Guardian concludes that Macron has defended the rise in taxes on fuel next year, which comes after a 23% rise in the cost of diesel and 15% in petrol in the past year. Ministers say price increases are mainly due to higher wholesale oil prices globally. But there is anger about taxes on fuel that have risen incrementally since 2014. Diesel is due to be taxed another 6.5 cents per litre and petrol by 2.9 cents in France from January. The government says its transport policy is aimed at long-term “ecological transition” and encouraging more environment-friendly vehicles. «I prefer taxing fuel to taxing labour» Macron said last week. «People complaining about rising fuel prices are the same ones who complain about pollution and how their children suffer». Critics say the rising fuel prices hits workers who depend on cars to get to and from their jobs particularly in the countryside. The dispute has sparked a rift between the city “elite” and the rural poor in France, where Macron has been labelled the president of the rich because of his tax breaks for business.